Closely monitoring air temperature is necessary to prevent mold, bacterial agents, and other contaminants in your cleanroom. It is also important for any temperature-sensitive products and equipment. Automating your data equipment can bring accuracy and convenience to your process. What else do you need to know about making such a transformation? Data loggers or recorders are used to record and store values like temperature, and include a range of software and hardware. They use sensors and other equipment to electronically track information. Models are available in portable, Ethernet, and wireless units. These loggers will accommodate both single and multi-channel systems. While liquids that are tested in pharmaceutical manufacturing are expected to be free from contamination, particles can enter as a result of handling and managing the water supply. Therefore, it is vital to measure particle contamination in these processes. Particle counters are primarily used to test finished products, but a second and equally-important application is monitoring quality of water for injection. Currently, two methods accomplish this: light obscuration and light scattering. This method directs a laser through a narrow capillary tube with a flowing stream of liquid. Particles that pass through the beam will block light, casting shadows across the photo-detector. A calibrated particle counter determines the sizes of the particles based on how much light is blocked. 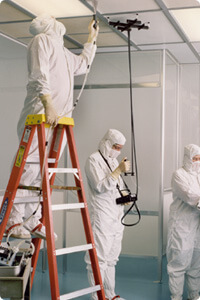 Traditional methods of detecting and correcting the presence of viable particles in a cleanroom can be lengthy. If present, viable particles can result in weeks of lost manufacturing time. However, non-traditional microbe detection significantly hastens the process of detecting and correcting the presence of viable particles. As with anything, there are downsides to these options, as well. Here is a brief comparison of options. Plates. Several methods use plates that are put in areas of interest (high-risk) around the cleanroom. The plates collect particles in the air for several hours. Then the plates are collected, incubated, and after colonization, identified and counted based on the surface area of the plate. This process takes 3-7 days, during which the microorganisms will only continue to grow. Ideal cleanroom conditions rely on accurate pressure readings. Air in a controlled environment is not constant, so it’s critical to prevent pressure changes. This ensures that pressure won’t be so low as to allow contaminates in or so high as to waste energy. What does it take to keep the device accurate? How many hours will staff need to spend calibrating and re-calibrating the device? Make sure the device is a high enough quality that you’re confident in the accuracy of its measurements.